Located in Khatuu Valley, Bayan-Ulgii provice,25km from Ulgi town. Khatuu camp opened in September 2016 and is located outside Ulgii town of Bayan-Ulgii province. Since then has been serving both quality interpretations of gourmet dishes and daring new ventures into the uncharted territories of food. Khatuu ger camp's interior, designed by locals, reflects the hip sensibilities of the surrounding area while also paying tribute to traditional Nomads. 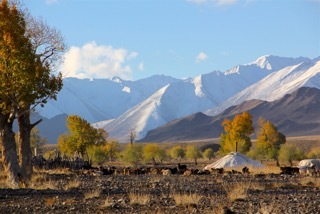 Nearby Kazakh Eagle Hunters and ancient petroglyphs are main attractions.